The recent visit of the Pope to Egypt will remain engraved in the history of Muslim-Christian relations, and those between Egypt and the state of the Vatican. Few know that the Vatican has two aspects, that of a State with the Pope as President, a Prime Minister, a Minister of Foreign Affairs, and Ambassadors to almost every country; and that of the Church with its Cardinals, representing the Church’s authority in every major city of the world. The Egyptian president reiterated the multitude of spiritual and religious sources for the people of Egypt and stressed, “Egyptians draw their inspiration from Islam and Christianity, and from the teachings of the Quran and the Bible.” Let extremists remember well the profound meaning of these words, words of the leader of a country that prides itself on its history, which is rooted in both Islam and Christianity. The President considers it a point of pride for his country that one of the pillars of world Christianity – St. Mark – lived in Egypt in 61 AD and established the Alexandria Church, contributing greatly to Christian thought and philosophy. The political leadership in Egypt encourages the understanding that Egypt’s history, both before and after Islam’s sacred message, includes the importance of Christianity. 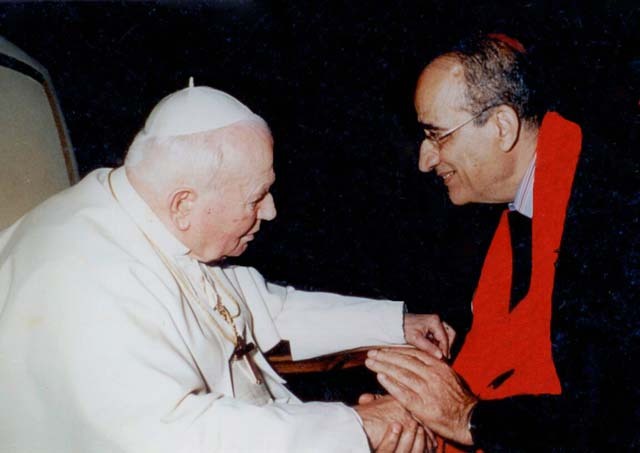 His Holiness Pope John Paul II stressed that Egypt was a cradle for Christian studies and played an important role in the preservation of the tenets and culture of the Church. He highlighted the importance of the historical role of Christian figures in Egypt such as St. Mark, St. Antonio and St. Catherine. A profound fact is that Egypt protected Christianity on its soil ever since the birth of Christ. The Pope also emphasized that Islam has been a religion of knowledge, enlightening Africa and the Arab world. The meeting between Pope John Paul II and Grand Imam Mohamed Sayed Al-Tantawy, surrounded by the Ulama of Al-Azhar Al-Sharif and heads of the Catholic Church, was a high-level meeting of symbols. It was an occasion concerning the Christian population with their different denominations and Muslims with their various affiliations, representing over half of humanity. Symbolically, much of the objective of the meeting was fulfilled by the very encounter of these two highly esteemed figures. Sheikh Mohamed Tantawy modestly and humbly bears the thousand-year-old responsibility of Al-Azhar to promote justice and defy unfairness. The Pope, with his worldwide influence, moves slowly and is burdened with the challenge of his lack of physical strength, yet completes his pilgrimage to Egypt and the House of Islam. A welcome gesture came from Al-Azhar’s officials who organized the visit with the Egyptian Ambassador to the Vatican. They seated the cardinals from the Vatican beside the Ulama from Al-Azhar. This confirmed that everyone came to cooperate, not only at the highest level, but also among advisors. Upon hearing the words of Sheikh Al-Azhar and His Holiness the Pope, it is clear that among the most important objectives of dialogue is the search for common ground, the common values between religions. These would include the promotion of justice and the rejection of injustice. We are at the beginning of the road, not the end. Our objectives require persistence and the continual reassessment of our intentions and words, in order to ensure that they represent the commonality of our beliefs.